NYCFC at Yankee Stadium. Photo by Jason Schott. 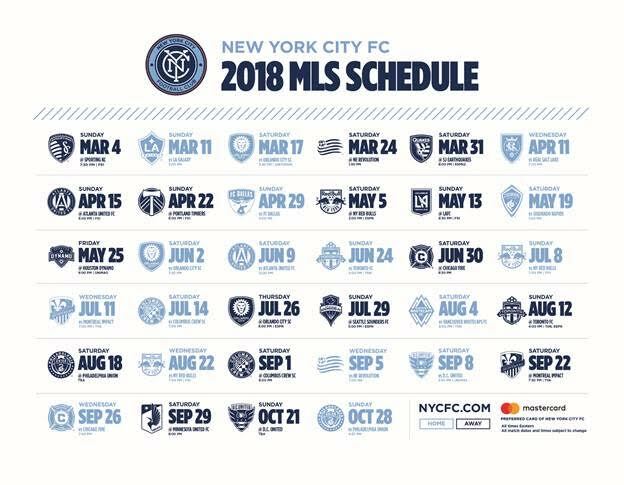 New York City Football Club announced their 2018 MLS Schedule in its entirety. Spanning eight months of the calendar, the schedule is comprised of 34 regular season games, including 17 at Yankee Stadium. As previously announced, NYCFC kicks off the season on the road against Sporting Kansas City on Sunday, March 4 and host the home opener at Yankee Stadium on Sunday, March 11 at 5:00 p.m. vs. the LA Galaxy. Following those two games, NYCFC will welcome fellow 2015 expansion team Orlando City SC to Yankee Stadium on Saturday, March 17 before travelling to New England for an early season tussle with the Revolution to close out the month of March on the 24th. NYCFC will host two derby games vs. Red Bulls this season at Yankee Stadium with the first taking place on Sunday, July 8 and the second on Wednesday, August 22. NYCFC will visit the Red Bulls on Saturday, March 5. Reigning MLS Cup Champions Toronto FC come to New York on Sunday, June 24 – following Atlanta’s second-ever trip to Yankee Stadium on Sunday, June 9. NYCFC will visit expansion team Los Angeles FC on Sunday, May 13 while D.C. United’s new stadium will be ready to host the squad on Sunday, October 21. NYCFC closes out the 2018 MLS regular season at home vs. Philadelphia Union on Sunday, October 28.